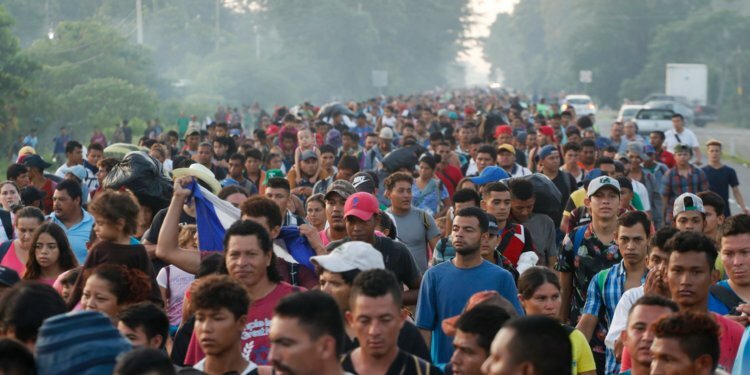 In a potent sign that the threat from Central American illegal immigration is far from over, reports have it that yet another caravan is forming in Honduras – a caravan that, thanks to publicity, could easily become the largest group of migrants to yet travel to the United States. News of the caravan, which is scheduled to depart San Pedro Sula on January 15, will only put more pressure on an already-tense standoff that has led to the longest government shutdown in the nation’s history. Not only that, but the caravan will also test the immigration policies of Mexico. Mexican officials have been forced to bear the brunt of the earlier caravans, members of whom are still camped out in Tijuana in the hopes that they can apply for refuge inside the United States. In response to the impending threat, the Mexican government has announced that they will “place guards at 370 illegal crossing points,” according to the Washington Post. Trump’s remarks reflect the futility of the current situation and the hopelessness of stopping these caravans under the current lay of the land. While the Department of Homeland Security is trying to block migrants from disappearing into the shadows by requiring them to stay in Mexico while their claims are being processed, that policy will require cooperation from Mexican officials. It’s not clear right now if we have that cooperation. Therefore, these so-called asylum-seekers will continue to flow into our country, unimpeded by law, by barrier, or by political will. In the Washington Post story, they talk to several Hondurans planning to join the caravan. One says he wants to “see a different place” while he is still young. Another says she is being abused by her niece’s father and mocked by the “macho men” in the area. It is not clear why either of them thinks that these are valid reasons to claim asylum in the United States. Then again, with the courts currently blocking the Trump administration’s efforts to bring sanity to asylum claims, they may be more clued in to the current situation than many American voters.